The rain has more or less stopped since this morning, thank God, that is indeed very good news. The bad news is that only now we’re becoming aware of how cataclysmic the situation is, mainly in the town of Obrenovac, swallowed up by water. Nobody still knows how many victims will be found and what is that water hiding down there. Many people were separated in rapid evacuations as boats and helicopters couldn’t accept whole families at once, and there are many of those that are still desperately searching for their loved ones. Belgrade people are carrying everything they can to the evacuation points to ease the lives of the victims of the flood at least a little bit. And the Sava is badly threatening both Bosnia and Serbia, thousands sand bags are constantly being filled to try to defend what is still left to save. The next 3-4 days if not even weeks are still critical, but we have to hope for the best and help each other. It is so wonderful to see that many people are doing all they can the way they can in order to help. Famous people are starting campaigns for the help of Serbian people and we are really thankful for their efforts and proud of them. We’re especially proud of Novak Djokovic, who is not only a great tennis player but also such a wonderful person and a big humanitarian. He’s currently playing at the tournament in Rome and together with his Davis cup colleague Nenad Zimonjic is doing his best to help his country. Nole was born and raised in Belgrade, less than 2-3 miles from where I live and I will always admire his hard and rocky road of determination and dedication to his dream that brought him to the place where he is now. What I will surely admire even more is the fact that he always had time and energy to be there for common people, always underlying that he is just one of us. It’s been years that we are cheering for him as he’s playing all over the world, and he is cheering for us right now. He truly deserves all the best in life. 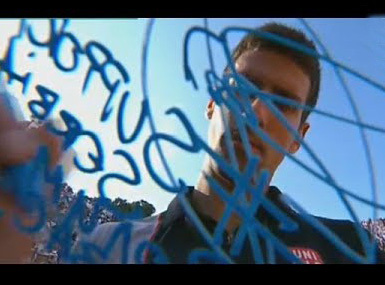 Novak Djokovic signing camera after today’s win against Milos Raonic in Rome and writing words of support to Serbia – #Support Serbia – I love you! Thank you very much for the support, any sort of genuine and sincere help will definitely be more than appreciated by those in need. The situation is indeed horrible in many senses and our region is really thankful for solidarity!